Are you coming to visit Lisbon for New Year’s Eve 2018-2019? Well, here are some recommendations. These are rather odd dates, because if one side there is a lot of animation, there are also areas where there are more shops closed and many “lisboetas” leave Lisbon to celebrate outside with family and friends. With the help of these suggestions … you will have a fun time for sure! On New Year’s Eve in Lisbon, the town hall organizes a show each year in the Plaza de Terreiro do Paço, in the dowtown area next to the Tagus river. It is free entry. On the 31st there are concerts starting at 10pm, and fireworks at midnight. In case you are more days in Lisbon, on the 29th and 30th there is a concert in the same place at 9:30 p.m.
As for where to dine, it’s a good subject as it’s always a somewhat complicated night. I would say that if you want to follow the Terreiro do Paço plan that I mention above, then look for a restaurant nearby and book it as soon as possible. There are many options in the downtown area. In case you do not want the “hang outside in the street” plan and want something more organized, there are several “private” parties in different places in Lisbon that you can buy tickets to. Some with dinner included, others just for the party. Party a little further from the center, in a former convent. Prices €35-€45 per person, including 3 drinks. They also have a dinner+party option starting at 125€/person. In the Royal Palace of Ajuda. This is already the fourth edition of the event. Among the guest artists is the DJ Joana Perez who “promises to bring the best of hip-hop and R’n’B to the Tapada de Ajuda”. Tickets cost between €25 and €45, with 4 drinks. There is also a dinner+party option that costs 100€/person. Party in a building right next to Terreiro do Paço in the old town. Prices €30-€40 per person, includes 6 drinks. In the Estufa Fria (greenhouse) there is also a party with the DJs Frederik, M.Dusa, Garfield and Huguinho The King. The party starts at 11pm and the value of the tickets starts at €40. The Revenge of the 90’s party will also happen on the 31st and it is the sound of the Spice Girls, the Backstreet Boys or Anjos. The place is in the Lisbon Coliseum. The values ​​start at €30. More information here. 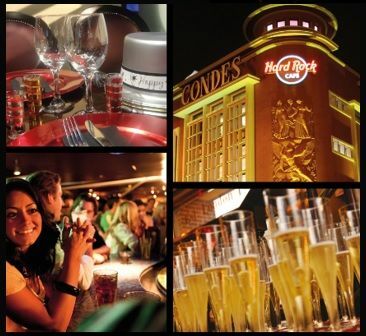 The Hard Rock Cafe Lisboa is another place to celebrate the New Year. From 11pm to 04h: €21, with two drinks included.